May 14th 2015. 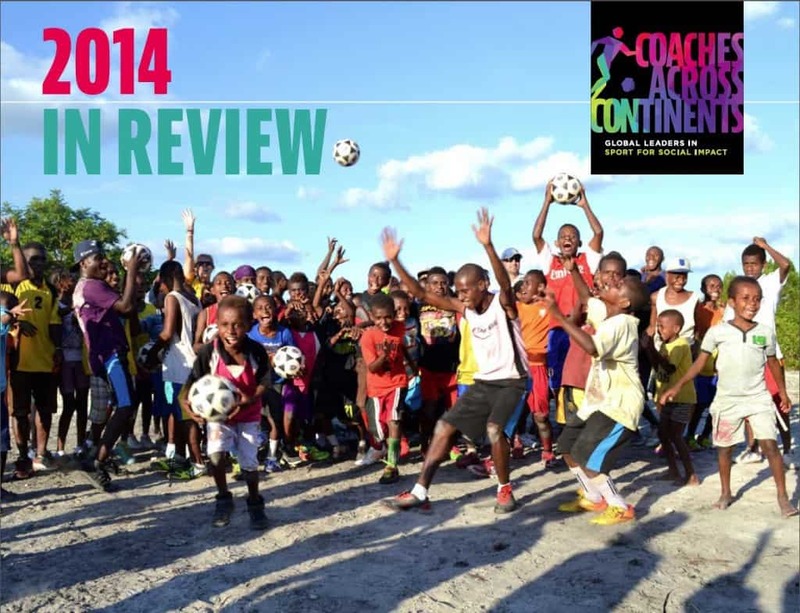 Coaches Across Continents are pleased to present ‘2014 In Review‘. In 2014 we had our most successful year yet. On-Field we worked in 26 countries with 74 implementing community partners and 1066 member partners. We educated 3,157 coaches who positively impacted 280,396 children. We implemented our Self-Directed Learning methodology which encourages participants to critically assess the needs of their community and create sport for social impact games to teach youth about these needs. Our child rights policy was signed by all 3,157 coaches who agreed to always protect children in their care. We increased the number of Community Impact Coaches who worked with us and partnered with organizations in 44 countries to implement games on Peace Day about resolving conflict peacefully. Off-Field we developed a mutually beneficial partnership with Chevrolet and One World Play Project based on their ‘What Do You #PlayFor?’ campaign. Pitches were developed in Indonesia, USA and South Africa where we ran sport for social impact programs. This partnership won Chevrolet the ‘Corporate of the Year’ award at the Beyond Sport awards. We also presented at high level conferences and events in places from India to Qatar and the USA. In addition we continued to develop our monitoring and evaluation system which has tracked significant changes in places in which we work. For example, 99% of coaches in Rwanda now know a soccer game to teach young people about how best to resolve conflict, compared to 33% prior to the CAC training. Click on the image to view 2014 In Review!